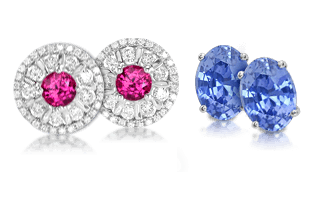 Earrings throughout history have been prized as works of art and status symbols, and for the stories they tell. 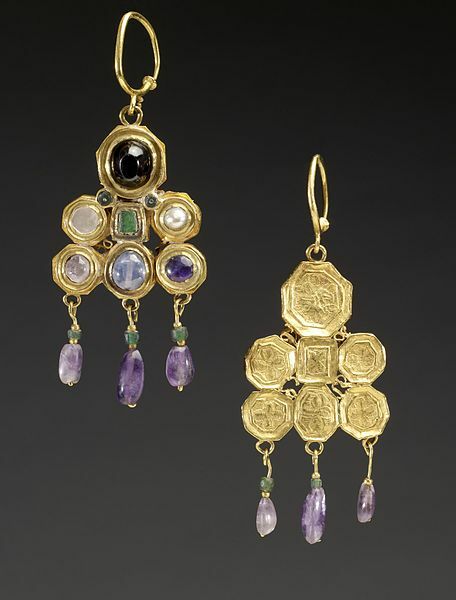 A pair of Byzantine era earrings with inlaid gemstones and etchings in the gold reverse. A sketch of Aditi, Hindu goddess. Aditi is a mysterious Hindu goddess. She is mentioned several times in the Rig Veda as the mother of both the god Indra and a group of demigods called the Adityas. 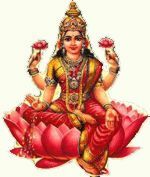 Aditi is associated with deliverance from physical and mental suffering, and she is often referred to as the Mother Goddess. Although Aditi has a relatively minor role in the Rig Vedas, her son, Indra, has a prominent role—about a quarter of all the hymns are addressed to him as the God of War or the God of Weather. 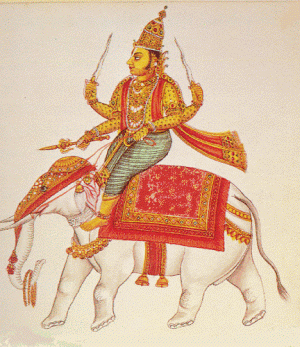 Indra, Aditi’s son, the Hindu God of War and Weather. Vasuki the snake wrapped around Mt. 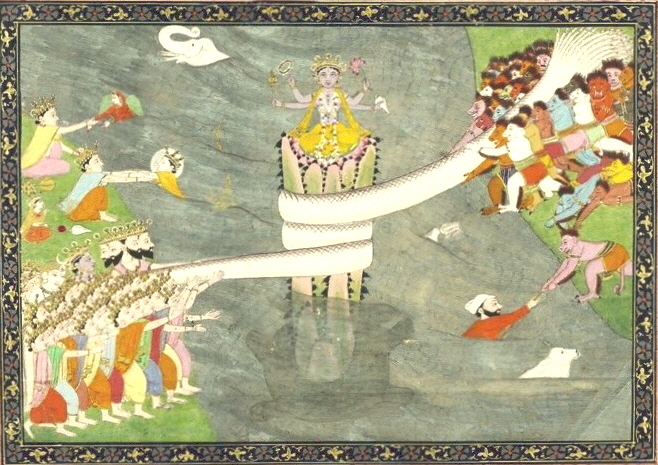 Mandara during the churning of the ocean of milk. In a later series of events, the demon king, Naraka, steals Aditi’s magnificent nectar earrings and imprisons 16,100 daughters of the gods and saints in his harem. Naraka had immense power and was not easily vanquished, but eventually Krishna devised a trick to bring him down, release the damsels, and regain possession of the stolen earrings. Before Naraka dies, he requests that everyone should celebrate his death with colorful light. Today, this event is celebrated in many cultures as “Naraka Chaturdhasi,” part of the greater Diwali, or Festival of Light. 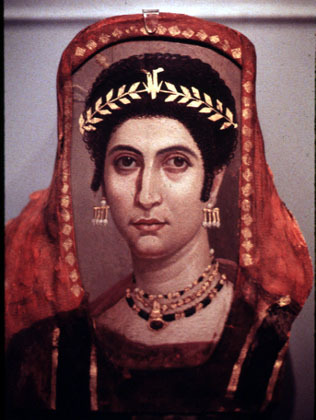 Cleopatra is well known for her brains, beauty, and desirability, but she was also an avid gemstone collector. 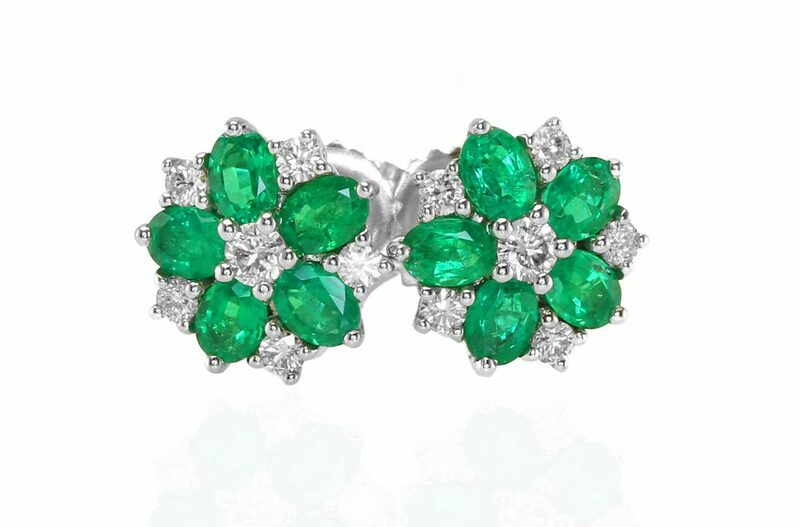 Not only did she have a special affinity for emeralds, but she also owned a pair of pearl earrings said to have been the most valuable in the world. According to Pliny, a 1st century author and naturalist, the story of these pearl earrings is a very interesting one. 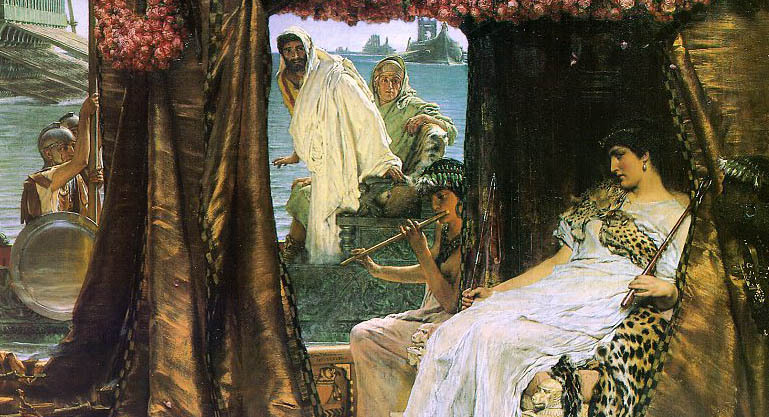 Antony and Cleopatra by Sir Lawrence Alma-Tadema (1883). 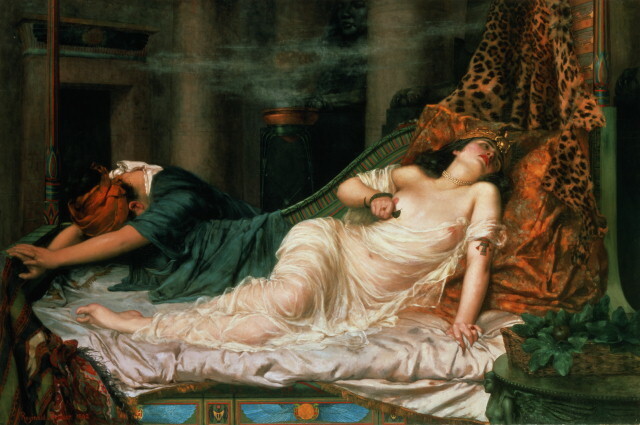 Cleopatra and her lover, Mark Antony, lived a decadent lifestyle and frequently hosted lavish banquets. At one feast, Cleopatra playfully bet Mark Antony that she could host a banquet costing ten million sesterces, a virtual fortune in those days. Antony took her up on the bet. Depiction of the death of Cleopatra by Reginald Arthur (circa 1914). On the evening of the banquet, acceptable but unspectacular food, drink, and entertainment were provided. When Mark Antony questioned the actual cost of the evening’s festivities, Cleopatra ordered a cup of vinegar to be served. She then removed one of her priceless pearl earrings, crushed it, dropped it into the vinegar to dissolve, and then drank the entire draught after toasting Antony’s health. An astonished Antony conceded that she had won the wager. According to Pliny, Cleopatra’s pearl earrings were worth 60 million sesterces, and he praised them as “the singular and only jewels of the world and even nature’s wonder.” Another source establishes their value as worth more than the combined value of 15 countries. After the death of Cleopatra, it is said that the other pearl was cut in two pieces and hung from the ears of a statue of Venus in the Pantheon in Rome. 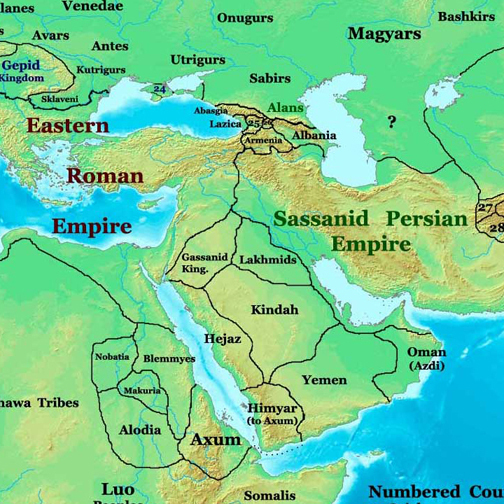 The Near East in 565 A.D. showing the Ghassanids, the Kindah, and the powerful Eastern Roman Empire, also known as the Byzantine Empire. The Ghassanids were an Arab-Christian dynasty known for guarding valuable regional trade routes and supplying troops to the Byzantine army. 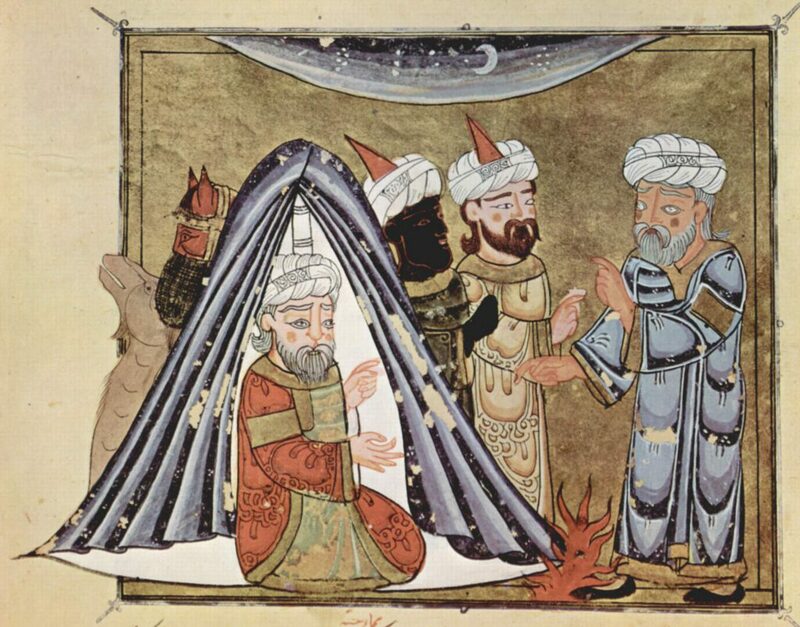 Despite the best efforts of historians, the scholars admit that Ghassanid history rests on shaky ground until the year 529 A.D. when al-Harith ibn Jabala succeeded his father as head of the tribal confederation. Al-Harith as depicted in Arabic folktales and sagas. Harith IV, or Jabala III, reigned from approximately 495-529 A.D. Harith IV is styled Al Akbar, “The Great,” the first of three famous Hariths who built the fortunes of the dynasty. Harith IV’s wife was from the Kindah tribe and she was known as Maria Dzat al Curtain, or “”Mary of the ear-rings,” because she wore two enormous pearls reported to be the size of pigeon’s eggs. 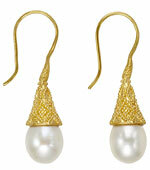 Contemporary pearl earrings with granulated gold are reminiscent of ancient styles. Although pearls had been harvested from the Persian Gulf and the Red Sea for thousands of years, a matching set of natural pearls of this size would have been infinitesimally rare and their value inestimable. Painted casket showing jewelry fashions of the 2nd century A.D.
For comparison, the Roman general, Vitellius, paid the expenses of an entire military campaign with the proceeds of one of his mother’s pearl earrings. In his Historia Naturalis, Pliny indicates that pearls “ranked first in value among all precious things” in the 1st century A.D. Many tales surround the ultimate fate of Maria Dzat al Curtain’s earrings. In some accounts, Maria presented them to a pre-Islamic, pagan temple in Mecca before her conversion to Christianity. In other accounts, they remain in the family and were worn as late as 637 A.D. by her descendant Jabala VI. 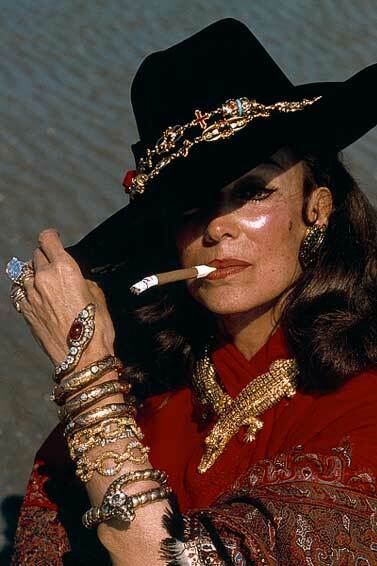 María Félix wearing her famous serpent clip earrings made of gold, enamel, and ruby. María Félix (1914-2002) was an icon of the golden era of the Cinema of Mexico. 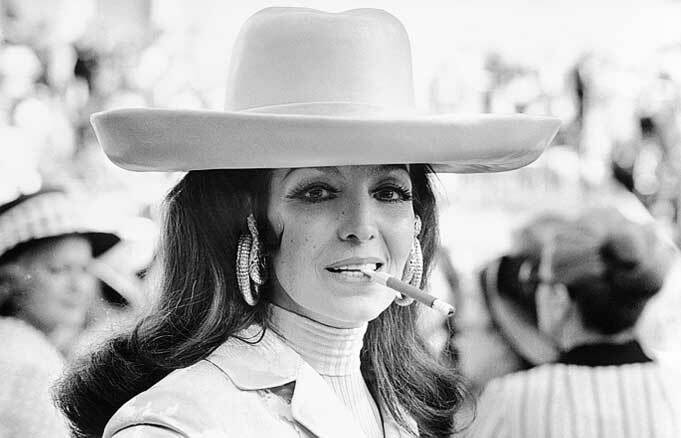 Famous for her beauty, her style, and her flamboyant personality, she was commonly known by the honorific La Doña. 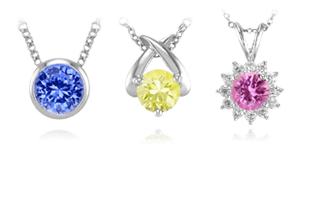 Muse for designers and artists alike, she also inspired new fashions in jewelry. María Félix wearing assorted jewels including her famed crocodile necklace. 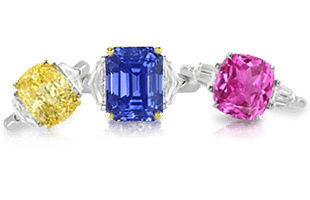 As a jewelry connoisseur with an extensive collection, Félix commissioned several famous pieces from Cartier. These items include a pair of serpent earrings as well as a serpent necklace. In 1975, she once again commissioned Cartier to create another necklace using a live crocodile she brought to the showroom, stipulating that it must be done to scale. The final necklace design featured two crocodiles made of 524.9 grams of gold, covered with fancy yellow diamonds and emeralds. 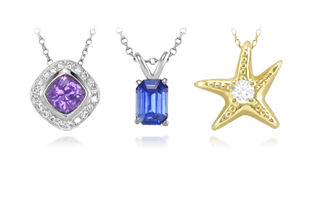 Continuing with the exploration of types of jewelry and their settings, learn about Necklaces and Pendants | An Introduction to History and Style next.